WHAT, WAIT… HOLD UP — is it Friday already? The bad news: it’s not. The good news: we’re being treated to the FULL content of one of WWE’s next 2017 DVD releases as our reveal week makes way for the complete listing! 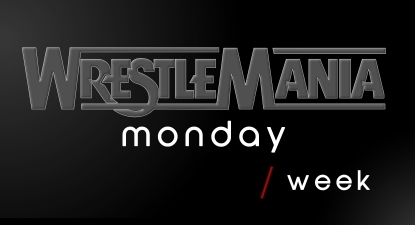 “WrestleMania Monday” went live for pre-order in the UK today via WWEDVD.co.uk, in addition to 3 more anticipated titles. Grab them all together and get 20% off with code “Q12017”. The early unveiling sees some initial extras (the “deleted” and extended scenes) still to be named, however everything else is here — all of the chapters for the documentary main feature, along with no less than 32 matches and moments selected from the RAW after ‘Mania! An expanded “WWE 24” episode, the documentary portion will delve into the history of the most exciting Monday Night RAW of the year as we hear from both WWE Superstars and fans alike. That’s joined by a compilation of the best matches, debuts, re-debuts, betrayals, and feel-good moments witnessed to date on arguably the most anticipated night in sports entertainment. The “WrestleMania Monday” DVD and Blu-ray set has also just gone up on Amazon.com for the United States market. Expect to see pre-order opportunities shortly. Great set. Not to gripe about anything but wish 2004, something from the night after WM20 in the match listing was included. Some other years are missing too. I hope this set is at some point followed by a SD After WM set. Maybe that can eventually be followed by sets on the Monday and the SD After Royal Rumble, Summerslam, and Series. Btw would also love to see some WWE24 episodes focusing on these PPVS. Very good set for new fans! I own a lot of this content already though. The WM X ten man tag that got cut from the live show and the Rhodes Scholars & Bellas vs Funkadactyls match that got cut from 2013. Maybe Big Show & Mark Henry vs. the Wyatts from 2014 too. The WrestleMania X ten man tag team match didn’t happen until two weeks after it got cut. So this focuses on Raw after WM. Hope this does good enough for WWE to do a SD after WM set, and other sets like Raw after RR, SSlam, SD sets after RR & SSlam, pre-Raw after RR, WM, SSlam focusing on SNME, Superstars and other WWE shows before RAW debuted in 93. And sets on the Road/March to RR, WM, SSlam focusing on the build ups to these big PPVS. Mzybe one day NXT versions of these sets may happen and i hope so. Only thing is I’d have added something from every year. As a user pointed out, 2001 is missing. So is 97, 99, 2004…. Definently a must buy for me! This DVD/bluray set feels like a throwaway. However, it would’ve been nice to see some matches with the wwe championship on the line over the squash matches or many of the secondary titles. A bit too much recent content but this is a good release overall. Too bad about no Undertaker/Bradshaw from 1996 though. I guess the cage matches from 1998 and 2001 are too violent to show in this era though. There was some other stuff I wanted and didn’t get but overall a DVD with Sparky Plugg is doing enough to show a wide variety of content. If interested, Taker/Bradshaw is on the Before They Were Superstars disc. I know. I wanted it on blu-ray because I like when they put the stuff that was on DVD only onto blu-ray. I am guessing the reason they didn’t know it is because Mankind attacks him after the match. That would reflect poorly on ‘Taker. Another one not talked about is Cactus Jack and Chainsaw Charlie losing back the tag titles to the New Age Outlaws in the cage. I would have loved for that to have made the cut. So Bret Hart’s speech the night after Wrestlemania 13 didn’t make the list?!?!?! You gotta be kidding me?!?! It’s probably best to ignore Austin’s heel turn in 2001. Horrible creative decision. Hurt business badly. Ratings fell off a cliff in 2001 after that. They’ve never reached anywhere close to that level since. Oh great, thats what we need a DVD that showcases obnoxious fans that try to make the show about themselves. Rock Vs Austin’s cage match from 2001 and I thought for sure Bret’s heel promo from 1997 the night after Mania 13 would’ve been on here too. No love for the Two Man Power trip. Bummer. But, overall a pretty cool set. Definitely Orton/Bstista should have been on this. Is there a match missing? I don’t see the 1st of the 2 tag team battle royals. From the looks of things either WWE is only including the second match, or they are both grouped under the same heading in the listing. It’d be cool to see both. I think you would need both those matches to tell the complete story it told. Cena and Michaels thought they survived the first match only to have a second thrown their way and what unfolded in that one. I liked it and hope the first one does make it.